This quilt will be raffled off Sunday at Doran Park in Bourne. After two years of Laura Hardon’s son Tomas running the concession stand at Bourne Braves games, she thought of a great way to give back to the community. 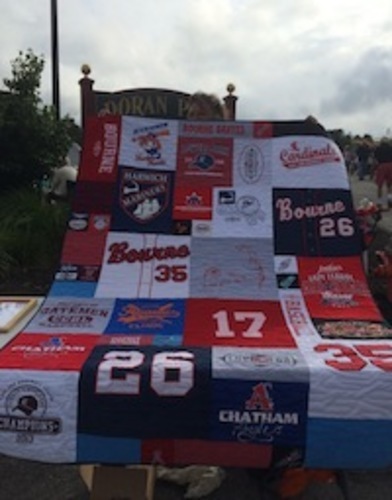 Hardon, a quilt-maker by trade, donated a large Bourne-inspired handmade quilt at the Friendly's Cape Cod Baseball League All-Star game on Sunday. She has made a second one, which features shirts and jerseys from all 10 Cape League franchises, to be raffled off Saturday, Aug. 2 at Doran Park, home of the Braves. Proceeds will benefit the Cape League. “The blankets took around 40 hours apiece to make and were something I wanted to donate to the Cape League that were unique,” Hardon said. Hadron lives in Arizona but spends summers on Cape Cod and is a frequent spectator at Cape League games. The quilt she made for Sunday's raffle featured Bourne Braves T-shirts and jerseys stitched together into one large quilt. All told, 500 raffle tickets were available to be bought at a price of $1 for five tickets, and $5 for 20. The lucky winner of the specially designed quilt was Elaine Brickman, who was ecstatic about her good fortune. “My husband is going to be thrilled,” Brickman said.